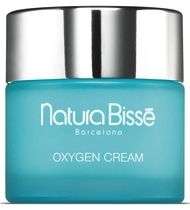 The Oxygen line by Natura Bissé is aimed at slightly maturing skin which needs a bit of TLC; some revitalization, some purification, some of its glow restored. It contains ingredients designed to help decongest the skin and restore vitality. I've been using Natura Bissé products for some years now, and decided it was time to annotate my experience with some of the different ranges. * These two were the ones that I've been trying out. This range is exactly up my alley - it's designed for skin with hyper-pigmentation, for skin that's started to age, for skin that is congested and/or clogged (definitely me during the summer!) and that has some small dilated capillaries and rosacea. These products contain, as their active ingredients, hydrogen peroxide, Natura Bissé's own Oxy-flow molecule, designed to infuse the skin with a shot of oxygen, and Living Water (harvested from Spirulina), which helps provide firmness and elasticity to the skin. Allegedly. I've been quite impressed with the different Natura Bissé products I've been using over the last couple of years. However the Oxygen Cream, despite being a seemingly good moisturiser, has a scent that I find truly, sadly, insufferable - it's a combination of an almost plastic smell and a sickly sweet smell. The Oxygen Gel is almost scentless. Both worked for me, I think the Gel probably would work better in the summer and the Cream in the winter - aside from the fact that I can't handle the smell of the latter that is. The "however" bit. This stuff contains hydrogen peroxide, designed to brighten and lighten the skin - you're warned to keep it away from eyes and brows (of course you should, it's a bleach, it will lighten your brows!) I am not sure I want to bleach my face, thank you very much. Both moisturiser formulas (Gel and Cream) contain parabens. The Gel contains silicones. I won't repurchase, for me personally there are just too many ingredients that I don't personally like in skincare products, but there's no doubting that the end result was good. 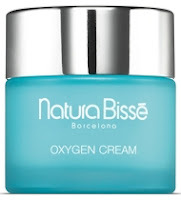 Natura Bissé is a brand from Barcelona - some but not all of their range is available in Harvey Nichols in Dublin. Failing that, Harrods in London also stock it. I've found it quite difficult to get online. Look here for more information on this range. I will be trialling a few items from different ranges from this brand and will publish more posts as that happens. My empties - replace or displace?